When you want to start investing, you might want to do so without the onerous task of having to pick each stock and decide when to trade it. Fortunately, there are algorithms for that. These algorithms, which are also called robo-advisors, are ideal for people who want to get started with investing but who do not want to spend all day watching the markets. Robo-advisors have many advantages compared to working with a human financial advisor but are they right for you? We compare Personal Capital vs Stash to help you decide between two of the best. Why Choose Stash or Personal Capital? Is Stash Cheaper Than Personal Capital? Which Robo-Advisor Is Best For Taxes? What If You Want To Speak With A Human Advisor? Does Personal Capital Or Stash Provide Better Tools? Personal Capital is an investment platform that combines computer algorithms with human advisors to help you manage your investments. It targets people who have at least $100,000 to start their investment accounts. You also gain access to tools that allow you to track your spending, net worth, and investment performance. Stash is an investment app that makes it easy for you to find and select investments. Designed for beginners, Stash features themes for different types of funds. The themes are easy to understand without a human financial advisor to hold your hand. The themes are separated by risk tolerance, investment goals, and your personal interests and values. You can select investment funds or individual stocks with Stash. Personal Capital is aimed at investors who either have a high net worth or who prefer to be mostly hands off with their accounts. Once you have customized a portfolio, Personal Capital takes a holistic view of your overall financial profile to keep you on track with your investments and taxes. Stash is an investment app that connects to your online bank account, including a cash-back debit card. When you use the card, you may receive rewards based on your purchases from a network of more than 7,000 merchants around the world. The online accounts have no overdraft fees. Personal Capital has a high level of hands-on assistance for investment management, and its fees depend on your account balance. The account management fee schedule is 0.89 % for the first $1 million, 0.79% for up to $3 million, 0.69% for $5 million, 0.59% for $10 million, and 0.49 % for account balances of more than $10 million. The average investment expense ratio is low compared to industry norms, at just 0.08%. The fees for Stash are also based on your account balance. Your first month with Stash is free regardless of your deposit amounts. Stash charges fees for the second and subsequent months that you use the app. If your monthly balance is less than $5,000, you pay a $1 account fee for non-retirement accounts or a $2 fee for a retirement account. For monthly balances of more than $5,000, you pay a 0.25% fee. There is no fee for retirement accounts if you are under the age of 25. Stash and Personal Capital diverge in the area of investment minimums. If you are new to investing and do not have a lot of money to put into your portfolio, this could be an important factor in your decision of which robo-advisor to use. When you have more cash to invest, you will have more options for account types and more access to the different services that Stash and Personal Capital have to offer to their customers. There is a $5 minimum opening investment requirement to use Stash. You could start your first month with a small amount and add to it each week or each month. This would give you an opportunity to try out the different features and to see how you like the service. You can add more money to your investment account with the Stash app at any time. Personal Capital has a minimum account opening fee of $100,000. If you have been setting money aside in another type of account, such as CDs or a general bank savings account, you could transfer that balance into a Personal Capital investment account. You may add more money to your Personal Capital investments at any time. The balances are recalculated on a daily basis, so there is no advantage to adding money at a particular time if you are trying to make the most earnings or to minimize fees. Got Lots of Financial Accounts? Personal Capital supports more account types than Stash. If you would like to have multiple account types or you already have several accounts and want to merge them into your investment portfolio, this is an important consideration for your decision. Personal Capital supports account types including individual retirement accounts. You can use it for a Roth, traditional IRA, rollover, or SEP IRA. It also supports and advises you about non-retirement investment accounts, trusts, and 529 college savings accounts. The Stash app supports individual brokerage accounts, traditional and Roth IRAs, and custodial accounts. >> Is Stash or Acorns Better? As important as it is to focus on investment performance, after-tax returns are what you take home. The Personal Capital tax strategy services include tax-loss harvesting for portfolios that include exchange-traded funds (ETFs) and individual U.S. stocks. They also include strategic tax information if you have a 100 % ETF portfolio. There is no tax strategy associated with the Stash accounts. If you have questions about how using Stash for investments would affect your tax obligation, you would need to speak with an accountant. Sometimes, having access to a human advisor makes a big difference to your decision-making process. Other times, you might not want to deal with a person. Consider whether or not you want access to human advice, which can be subjective. With Stash, you do not have access to human financial advisors. If you choose Personal Capital, you do have access to financial advisors for certain account types. These financial advisors are available 24/7. You also have access to certified financial planners through Personal Capital. Tools and calculators allow you to track your financial goals better. And you can use the tools to determine your investment strategy. As a Stash app customer, you will have access to different tools for managing your investments and making decisions. The tool is called Stash Coach. It includes quizzes, trivia, and guidance for allocating your investments. Personal Capital has world class tools and its mobile app is cutting-edge. You can use the tools to simulate investment growth over time or to compare trends of different funds or individual stocks. The tools also include retirement and education expense planning and calculators for comparing fees to returns. >> SoFi or Personal Capital: Which Is Best? Personal Capital and Stash support different asset classes. If you are a new investor, you may not know a lot about these asset classes. Personal Capital supports ETFs and individual stocks as well as bonds. A mix of ETFs, individual stocks, bonds, cash, and other asset types are weighted according to your tolerance for risk and reward objectives. Stash features up to 110 individual stocks and a range of ETFs. It renames ETFs so that you can understand what they are all about. Instead of jargon-filled names, Stash calls them “Modern Meds” and other classifications that are explanatory based on what companies’ stocks are in the ETFs. Personal Capital offers phone and email customer support services on a 24/7 basis. A lot of information about the available accounts, fee structure, and services is available on the company’s website. Stash also offers phone and email customer service. The available hours for phone support are Monday through Friday from 8:30 a.m. to 6:30 p.m. Eastern Standard Time and Saturday and Sunday from 11:00 a.m. to 5:00 p.m. EST. Stash’s email support is available on weekdays during the same hours. The company’s website is easy to navigate, and information is not difficult to find. Personal Capital has a world class personal finance app that is virtually unparalleled. Whether you want to track your income, monthly outflows, net worth or simply take advantage of retirement planning forecasts, it’s got it all and then some. Stash’s entire investment service is an app. Stash offers easy navigation and an intuitive layout. Both Personal Capital and Stash offer helpful tools and investment advice to help you make sound financial decisions. Because these two robo-advisors have so many differences, it’s like comparing apples to oranges. 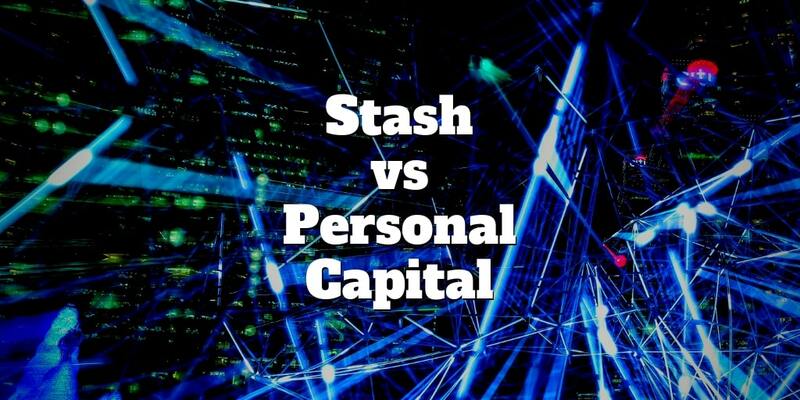 Personal Capital and Stash have different target demographics. If you have a small amount of money to start your investment portfolio, Stash is the clear winner. However, it is also your only choice of robo-advisor for small investment amounts. When you are new to investing, Stash is an easy and convenient way to get a feel for the process without getting overwhelmed. If you have more available cash to invest, the robo-advisor that you pick is more of a personal preference. If you prefer a lot of human interaction and the ability to manage a diverse array of accounts, Personal Capital is a great choice. ‹ Betterment Review 2019 – Up to 1 Year FREE!